Meets the Science of Where. 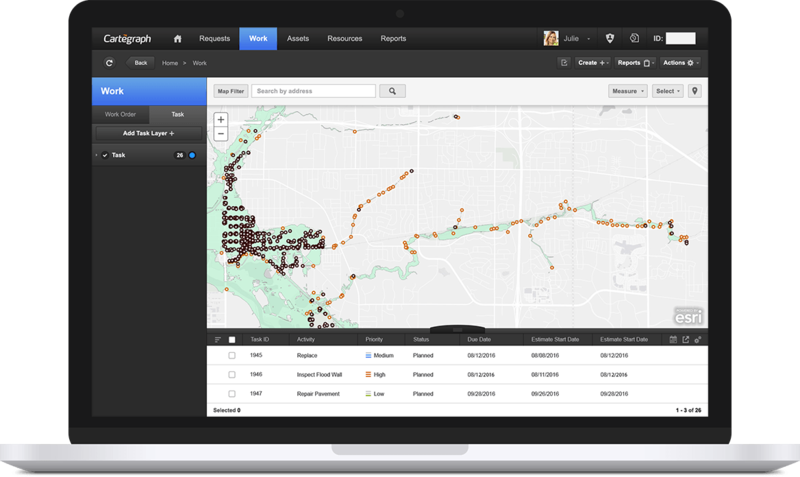 Pairing Cartegraph’s high-performance software with Esri’s powerful GIS technology helps your team see where things are happening and how information is connected. The result? Increased productivity, data-driven problem solving, smoother operations, and a better experience for your citizens. Leverage Esri web maps for all types of analysis and decision-making. What caused my 8” PVC sewer pipe to fail before it was predicted? Analysis of the soil bed the pipe is laid in revealed a montmorillonitic soil type, prone to expansion. How do we prepare our system for a potential flood event? Establishing a proactive response plan that covers every asset in the floodplain ensures work will be generated to prepare all assets to perform at an optimal level. Why are there so many graffiti removal requests on the west end of town? Analysis of street lighting infrastructure highlights an insufficient amount of lights within this location; lack of night time lighting is a potential cause for increased graffiti vandalism. What is the potential financial impact of the forecasted flood? Spatial analysis of the assets in the impacted area, layered with the anticipated work data, provide an estimate of the fiscal impact to the community. Do more with your maps. 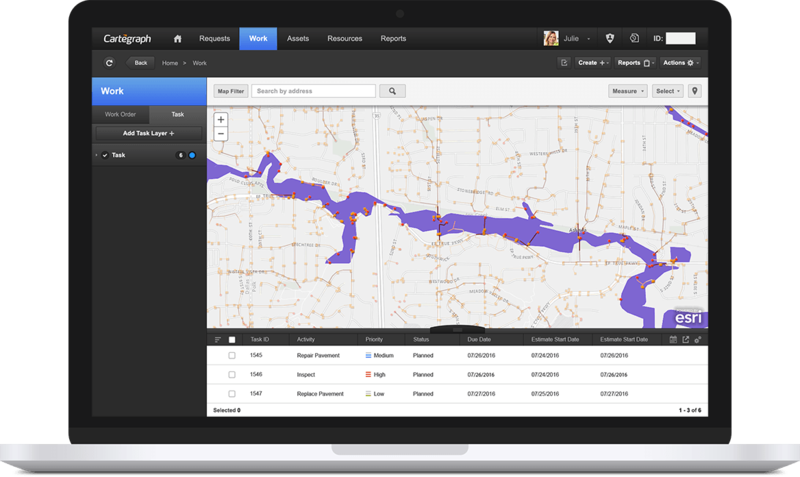 Efficiently combine powerful spatial analysis tools with pertinent work, condition, and cost data to make informed decisions on everything from project planning to disaster preparedness. 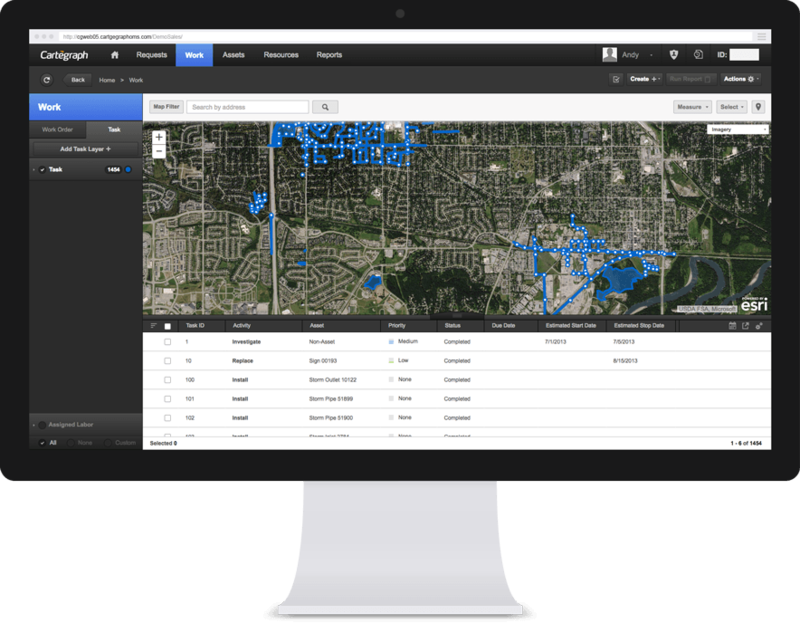 Uncover how pairing operations management and GIS systems together is the most effective, efficient, and productive way to manage your day-to-day operations. 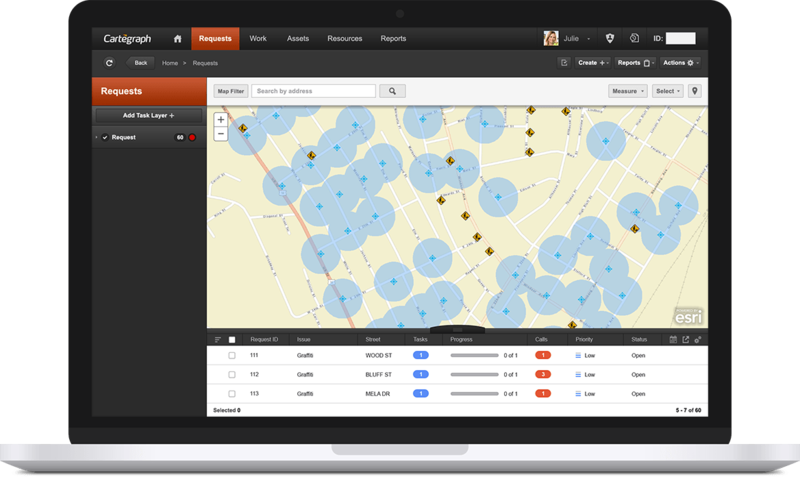 Build on the investment you've made in maturing your GIS by seamlessly integrating with Cartegraph. Unlock the ability to pull spatial locations of assets from ArcGIS™ as you push attribute and spatial data changes back in real time. Maps for all types of users. Produce web maps in Esri™ and use them in Cartegraph. Access data from operational layers. And tailor maps to your individual needs. Use history to predict the future. Records chronicling an asset’s condition and maintenance history help you anticipate the need for repairs and replacements. Child records tell you the what, where, when, why, and cost of every asset in your inventory without impacting your spatial data. Easily access Esri tools in Cartegraph. Measure distance or area, select objects spatially, and conduct spatial analysis against both work and asset information to guide decision making. Leverage Cartegraph data in ArcGIS. Use your asset condition, work history, and cost data to solve problems unique to your organization.